The Hongo Campus is home to the Faculty of Foreign Studies, the Faculty of Business Administration, and the Faculty of Health Science Technology. Clinical laboratory medicine students are based here starting in their second year. 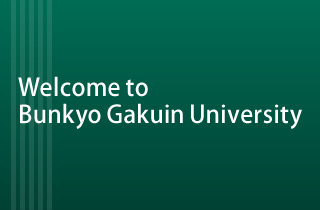 The Bunkyo Gakuin College and the Graduate Schools of Foreign Studies and Business Administration and Health Care Science are also located here. The Hongo Campus is situated in the heart of Tokyo, the capital city of Japan. The Hongo area is well known as a beloved district of many famous Japanese people of culture, including Natsume Soseki and Mori Ogai. The campus is easily accessible because it is located at a primary station on a major Tokyo metro (subway) line. The university is located in an outstanding academic environment. It is close to many educational institutions, parks, historical sites and cultural facilities. An important part of the Hongo Campus is the Ishiko Shimada Memorial Hall, which houses a 834 seat multi-purpose hall. This building is the centerpiece of the campus and is surrounded by a wide variety of other facilities that provide support for all of the student's daily needs. These facilities include a library that houses, more than 140,000 volumes and a multi-media center that provides computers with an interface in six languages in consideration of the exchange students on the campus. Another facility includes the Center for Intellectual Property and Multilingual Digital Media Content, which provides educational support relating to intellectual property and a computer training room.